This past summer I was going on a trip overseas and needed a lightweight laptop. I was tired of carrying a large, bulky computer around that had to be placed in its own huge bag. As I shopped around, I weighed different types of netbooks. The lightest one I found at my local electronics store was the Gateway netbook weighing less than 3 pounds. The exterior is shiny and looks classy and chic (I have mine in black), which is a big plus for a fashion-conscious gal! 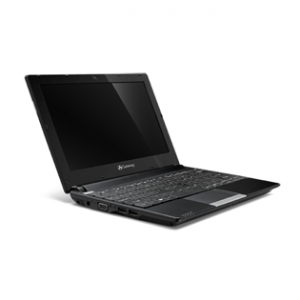 Even though it’s a netbook, the screen features a comfortable 10-inch size display and the easeness of the keyboard works well. The netbook was my constant companion as it allowed me to keep in touch with family and friends back home through the internet and through Skype with its built-in webcam. It was also easy to upload photos and bits of video footage to the media gallery and share with my loved ones. With its three USB ports, I was able to charge my ipod, plug in a USB flash drive to open files and even plug in the USB cord to download photos from my digital camera, as I made daily updates of my many adventures. As a frequent commuter, I still carry it with me everywhere and find that it can even fit in a large purse. It allows me to plant myself anywhere there’s WIFI and work comfortably. It has an easy connectivity to the internet and three USB ports still come in handy. After I’m done working, I just slip it in my tote bag and go. It has a limited storage space. I managed to install two HTML editing programs but the system was slow and ran out of space. I had to uninstall the programs and keep things at a manageable level. Also, it sometimes takes a long time to start up and it seems like it regularly is running updates. Sometimes, it takes a while to shut down as well. Ultimately, this is a great computer to tote around but works well for what netbooks are best at: internet use and word processing.